kmz098, 15 Oct 2012planning to buy a note 2 but im really worried about the size. im a short fellow and some of m... moreWhy don't you just go to a Samsung store and try it out yourself? Its all on your personal comfort level, isn't it? Only thing that has been said and I will repeat: Keeping it in pocket can be an issue if you are used to wearing skinny trousers, else you should be fine. planning to buy a note 2 but im really worried about the size. im a short fellow and some of my friends suggest its not for me. next option is an SIII but im not very excited about it and i dont want to move to iphone5 from my current iphone 4.
would be really helpful if someone who has used/ is using a note or noteII could comment on its comfort in use. Anonymous, 14 Oct 2012-Sony has had so called retina display since like 08. Most of the top phones today have *RETIN... morei reckon an iphone5 camera was used to film lumia 920 video, and you'r wrong, the only retina displays are apple's. I'm curious about the audio comment saying the iPhone5 might be a slightly better choice for audiophiles. In my opinion, clean audio is more important than loud audio plus you can always get an app or kernel to make a device louder. It seems difficult to get better crosstalk, etc. results without a hardware re-design. This is not a trolling post. However, could someone explain where my logic is wrong? I'm considering several phones including the S3, Note 2, and the iPhone 5. Thanks for your time. I am mostly happy with this phone. The thing I don't like is I can not lock the exposure to reframe in camera. I can do this easy in N8. Removable battery? Extreme downfall. No SD slot? Extreme downfall. IOS? Extreme downfall. dudin, 14 Oct 2012all that is nothing compared to iphone5: -retina display -siri -3D maps -camera better tha... moreIcrap doesn't have micro sd slot,needs itunes for file transfer,so costly. Nowadays some mad peiple only going back of i craps. -camera better than any other (and i have DSLR which now i don't use anymore, why they keep selling those? )-and lumia is no better. were faked videos. the only thing i accept iphone is not the best is the lack of replaceable battery. Take note that 4G capability is not available in most countries. They wouldn't even dare put the 4G chip in the international version. Why can't Samsung make 4G available out of the box? Apple can do it with their iPhone 5 can do it, why couldn't you, Samsung? 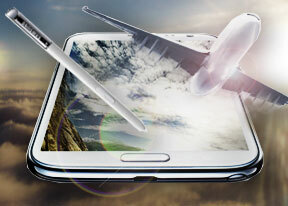 Should we wait for Galaxy S4 or Note 3 before we get 4G as a standard? After a long long confused weeks, I got to see both Iphone 5 and Galaxy Note 2...As a MAC lover waited for Iphone for a long time...Loved my first 5 mins with the device and then got bored as I was using Galaxy S2 prior to this and I hardly saw something new and exciting....But that was not the same case with Note 2....I litreally spent 30 mins and dint lose my excitment.. I have a few small and a big addition and one error in the review to add. -with the video camera you can do slow motion videos up to 1/8 and fast motion up to 8x times the normal speed and not just 1/2 and 2x as you mentioned. Besides that a great and comprehensive Review. Axe Effect, 09 Oct 2012I think they took care of that: http://www.gsmarena.com/galaxy_note_ii_firmware_update_is_out... moreWhat is SW ? Best phone ever really beyond expectations, the battery is great 10 hours medium working and it still 49 % , the s pen is a legend now really usefull and it is a big jump from sgn1 to sgn2, great work samsung. will lee wanta, 05 Oct 2012clearly you never use a galaxy note. s-pen is not just a stylus. If you work in creative worl... moreFilm quote from Alien vs Predator, "I have a gun as the same principal as a condom, I'd rather have one and not need it than need it and not have one"